Through its ten strategically located concrete batch plants at eight locations and its state of the art GPS centralized dispatching, Syar Concrete is able to supply its customers optimally from various locations in the most efficient manner to the benefit of each customer’s schedule. 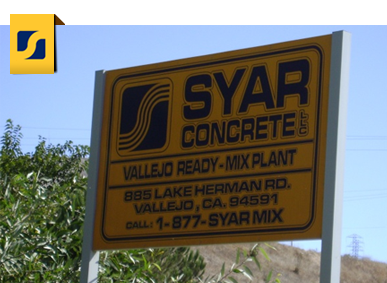 Choose A Syar Concrete Location Near You Below! 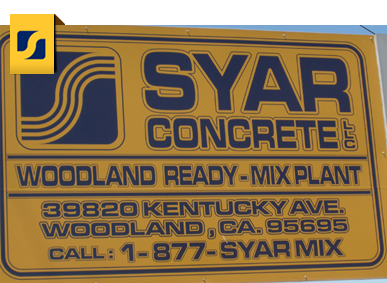 Syar Concrete’s Woodland Readymix Plant, located in Woodland, Yolo County, is geographically positioned to service customers in Sacramento, Yolo, Yuba, and Sutter counties with Caltrans specified concrete products. This plant is connected to Syar Concrete’s other locations through a centralized dispatch system which serves the needs of customers by dispatching readymix concrete products to construction projects from the plant with the quickest haul. Syar Concrete’s regional office is also located at this facility. 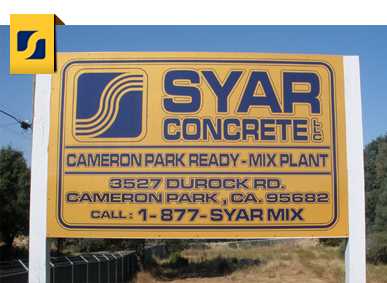 Syar Concrete’s Cameron Park Readymix Plant, located in Cameron Park, El Dorado County, is able to supply Caltrans specified concrete products to Sacramento, El Dorado, Placer and Amador Counties. The plant also produces concrete barrier blocks. This plant is connected to Syar Concrete’s other locations through a centralized dispatch system which serves the needs of customers by dispatching readymix concrete products to construction projects from the plant with the quickest haul. 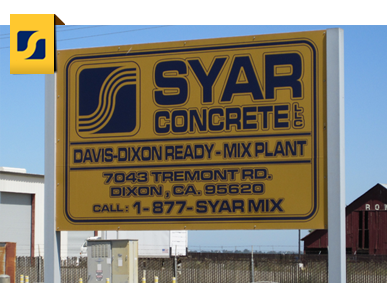 Syar Concrete’s Dixon Readymix Plant, located in Dixon, Solano County, is geographically positioned to service customers with Caltrans specified concrete products in Sacramento, Yolo, and Solano counties. Strategically located near Interstate 80 and UC Davis, the plant is capable of reaching many projects from Fairfield to Sacramento. This plant is connected to Syar Concrete’s other locations through a centralized dispatch system which serves the needs of customers by dispatching readymix concrete products to construction projects from the plant with the quickest haul. 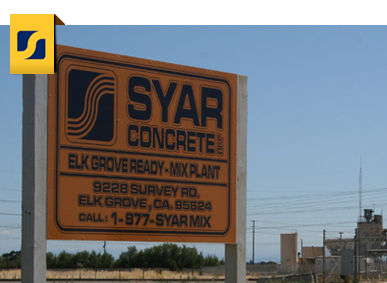 Syar Concrete’s Elk Grove Readymix Plant, located in Elk Grove, Sacramento County, is geographically positioned to service customers in Sacramento, San Joaquin, Solano, and Amador counties with Caltrans specified concrete products. This plant is connected to Syar Concrete’s other locations through a centralized dispatch system which serves the needs of customers by dispatching readymix concrete products to construction projects from the plant with the quickest haul. 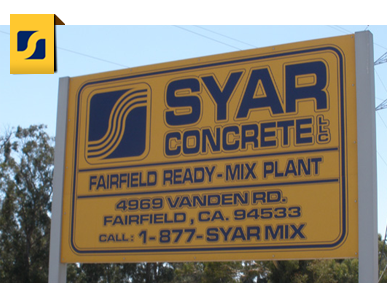 Located near Travis Air Force Base in Fairfield, Solano County, Syar’s Fairfield Readymix Plant services customers with Caltrans specified concrete products in Solano, Napa, Contra Costa and Sacramento counties. This plant is connected to Syar Concrete’s other locations through a centralized dispatch system which serves the needs of customers by dispatching readymix concrete products to construction projects from the plant with the quickest haul. Among other significant regional projects, this high production twin alley plant supplied much of the concrete poured at Travis Air Force Base. Syar's high production Vallejo/Lake Herman Readymix Plant, located in Vallejo, Solano County, primarily services Contra Costa, Napa and Solano counties as well as areas of Marin County with Caltrans specified concrete products. This plant is connected to Syar Concrete's other locations through a centralized dispatch system which serves the needs of customers by dispatching readymix concrete products to construction projects from the plant with the quickest haul. Among other significant regional projects, this plant supplied much of the concrete poured at both Carquinez Bridges. 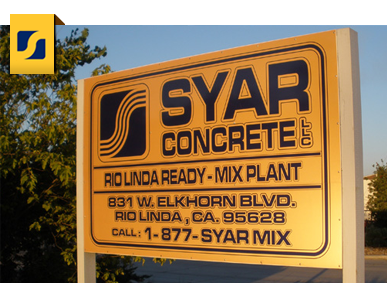 Syar Concrete's Rio Linda Readymix plant, located in Rio Linda, Sacramento County, is strategically located to serve Metropolitan Sacramento, West Sacramento and southern Placer County. Its dual alley plant is capable of producing Caltrans certified concrete at over 300 cubic yards per hour. This plant is connected to Syar Concrete's other locations through a centralized dispatch system which serves the needs of customers by dispatching readymix concrete products to construction projects from the plant with the quickest haul. 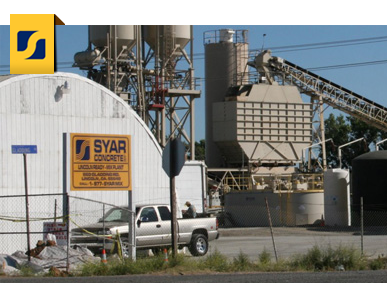 Syar’s high production Lincoln Readymix Plant, located in Lincoln, Placer County, services Placer, Sacramento, El Dorado, Yuba, and Sutter counties with various Caltrans specified concrete products. This plant is connected to Syar Concrete’s other locations through a centralized dispatch system which serves the needs of customers by dispatching readymix concrete products to construction projects from the plant with the quickest haul. Among other significant regional projects, recently the Lincoln readymix plant supplied concrete for the new Highway 65 Bypass and the Thunder Valley Casino Hotel/Parking Garage.